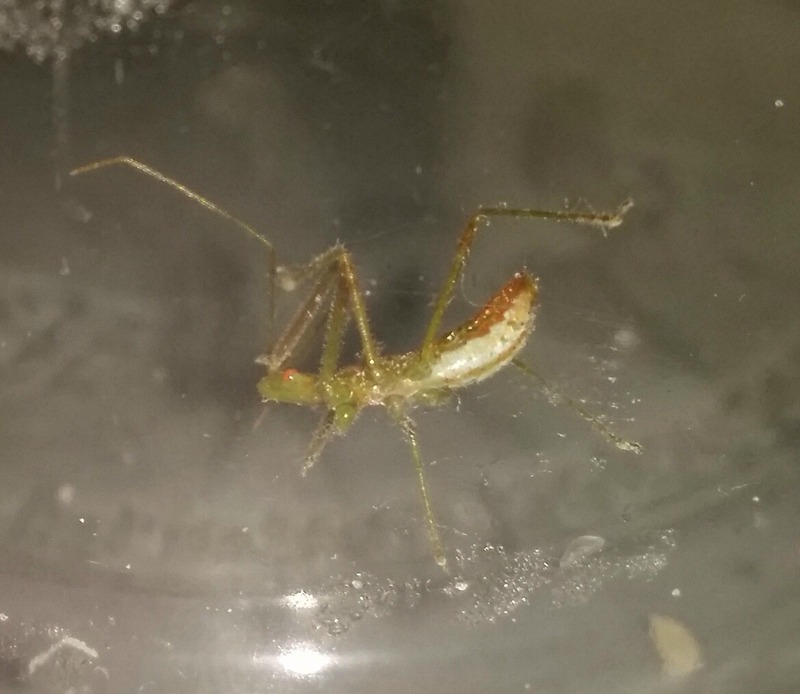 Tiny assassin bug before (or possibly after) surgery. Even more silence with extra silence on top. Glance at tiny bug looking enormously pathetic in a plastic container. 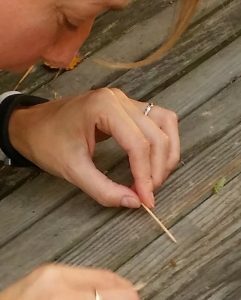 Which is how I ended up performing toothpick-based spiderweb-removal surgery on a baby assassin bug on our patio table one sunny afternoon last autumn. 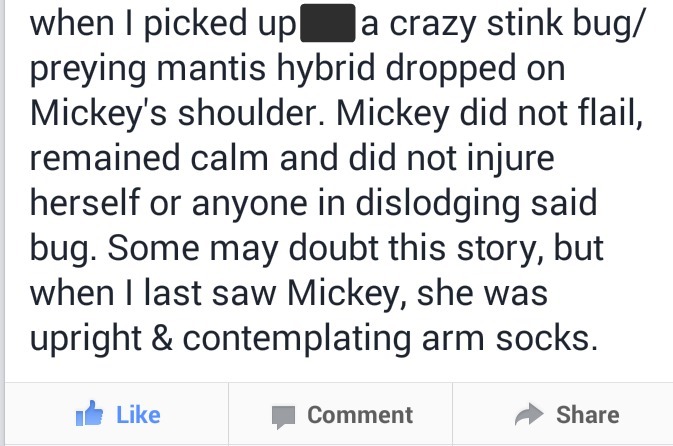 I don’t mean to brag, but I have a history with assassin bugs. The first one I ever saw was at a winery in northern Maryland. I’d never even heard of an assassin bug before that, but this bug came to hang out with us, which was totally fine until I noticed the GINORMOUS MANDIBLES OF DOOM. That’s when the phones came out as we frantically tried to identify it. I’ll be the first to admit my eyesight isn’t the best. I like to think it helps me live a more relaxed life because I don’t notice things like proboscises until it’s far too late to do anything about them. 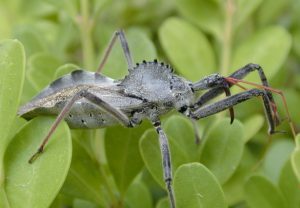 Anyway, it turned out to be a wheel bug, which is a type of assassin bug. It’s the largest terrestrial “true bug” in North America, and can grow up to an inch and a half in length. Which makes me wonder if there are aquatic “false bugs,” but whatever. It kills by INJECTING ITS BEAK INTO ITS PREY, squirting out some crazy enzymes that paralyze AND THEN DISSOLVE THE INSIDES of the unfortunate victim, which the bug then slurps back up THROUGH ITS PROBOSCIS. Its bite is VERY PAINFUL and takes a long time to heal. Did you read the part about STABBING ITS PREY WITH ITS PROBOSCIS? 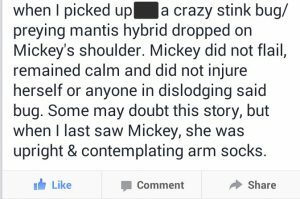 It is noted to be “very vicious” in the wild, a statement that jumped out at me because are there domesticated assassin bugs? They are very shy (except, one supposes, when they are being “very vicious” and injecting things with their beak). Their flight is categorized as “clumsy” and “noisy.” This is notable first because those words are so often used to describe the way I move. Second, I like insects that go out of their way to warn you that they’re approaching. Third, “erratic” flight means they probably can’t intentionally target anything (and by “anything” I mean “me”). They are slow. Bugs I can outrun? Best. Bugs. EVER. They have a rather badass spiny wheel-looking thing on their back. They really do indicate a healthy garden, which is pretty interesting considering the only things we’ve managed to successfully grow are kale, mint and roughly seventeen thousand tons of parsley. They are called assassin bugs because they kill and eat other bugs. Now I’m not trying to get all paranoid, here, but for a shy insect they tend to find me A LOT. First at the winery, next at a polling place on election day. I was standing there speaking with a friend when one lurched out of the sky and landed right on my shirt. It speaks volumes that I had to document this. Last fall’s impromptu bug surgery was successful. I think. I did my best to gently remove as much spiderweb as I could from the tiny bug. All of its legs were stuck together at first, and I’m pretty sure I freed most of them. I’m almost certain I didn’t accidentally remove one, so that’s nice. Once I finished, I gave it a pep talk and found it a nice, safe, spiderweb-free spot and let it go. I made sure the dogs didn’t accidentally step on it. Or eat it. Or poke it in the proboscis. Were other assassin bugs watching me the whole time? Do they know I saved the tiny bug, or do they think I was torturing him? Am I under the protection of the Local Guild of Assassin Bugs, or am I under surveillance? Are they here to support me, or are they biding their time before they go all John Cusack in Grosse Pointe Blank? Either way, at least I’ll hear them coming. And I’ll have a solid chance of outrunning them. All photos mine except for the really great one where you can actually SEE the wheel bug. That one’s from Texas A&M AgriLife Extension. I dare you to add “Bug Surgeon” to your Linkedin profile. More importantly, I’m trying to open negotiations on taking out the insane fly that’s been buzzing through the house all weekend. Headed outside with some fresh kale now. Thanks, Eric! Bugs and I have an interesting relationship. It’s still shocking I made it back from Australia alive. 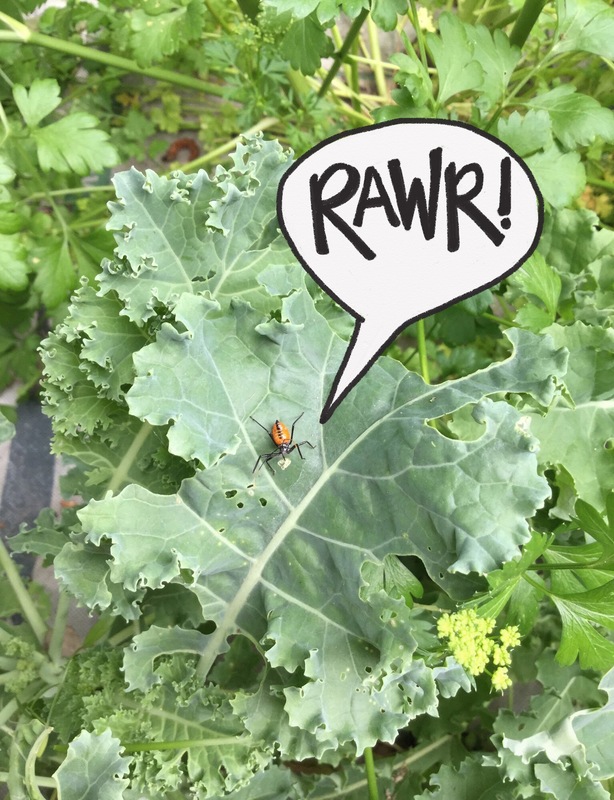 All hail, the one true bug, protector of kale! 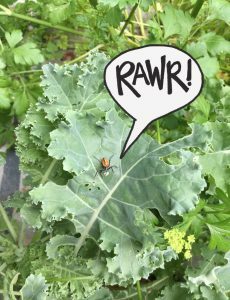 One kale leaf to rule them all? Is it just me, or wouldn’t something that has erratic flight be MORE likely to get you? Ms. Gomez, you need no assassin bug to kill me. Every time you post. You know, I thought of that, Bob. Practicing my stately walk now, so maybe they won’t recognize me? Related: we found THREE assassin bugs in the garden this morning.